The Gnu Ladies Pickle is a pretty solid all around park ride that is PBTX but the 2014-2016 profile was changed up a bit. It’s subtle but it does change up the ride a bit or at least it felt that way to us. BTX and PBTX use to be true continuous rocker but this year it’s got rocker in the middle that transitions to flat or a very mild camber. This is still pretty much PBTX but it’s a small step closer to C2 PTX. This is best with a duck stance because of the asymmetrical side cuts. On Snow Feel: The Ladies Pickle 2014 runs a little more flat than some of the other BTX boards out there giving it a little more stability between the feet. The new PBTX camber profile makes the ride a little more stable than the past years models. It’s not stable like the EC2 BTX or C2 BTX but it’s an improvement over the other BTX models. Powder: Pretty good in powder for its size and shape. 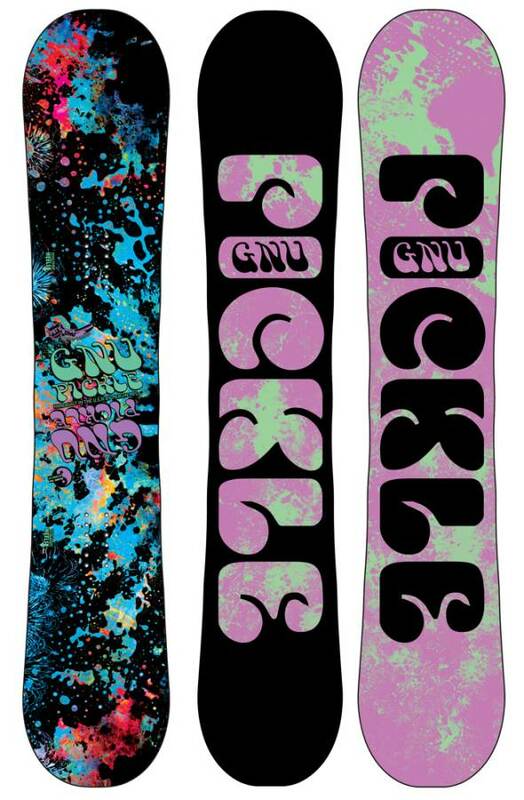 The Gnu Ladies Pickle 2014 planes well in powder and doesn’t like to sink. It’s not the best ride out there but its fine for a freestyle rider that wants to ride switch and regular in powder. Turn Initiation and Carving: There is a marginal improvement in carving but the Turn Initiation is about the same quick and easy edge to edge ride as before. It’s got a little better feel turning and carving holds an edge well like before but it’s a little less washy. Still nothing to write home about but it’s playful and fun. If you are ok with riding duck then you will find this more fun edge to edge than most BTX side cuts. Speed: Not really a bomber board but it can handle anything in the park and moderate speeds on the mountian. Uneven Terrain: Not really a mountain board but you can go out into bumps and handle them well. Edge Hold: Really grippy and excellent for those that see harder conditions. It can be a little grabby in harder conditions. Flex: Nice medium soft flex that works it’s way closer to soft over time. Switch: PBTX is asymmetrical in the side cut and that makes it much easier to ride switch. It makes good switch riders better and it makes it easier to work on flipping the board around. Jibbing: This is a top notch jibbing board and it can make you feel comfortable just about any where in the jib park. Pipe: If the edges stay sharp the Gnu Ladies Pickle 2014 is a pretty fun pipe board. It’s not amazing but its edge hold is perfect for icy pipes and it’s pretty forgiving. There is a slightly better feel with the new PBTX profile but it’s not enough to bump it from good to great. 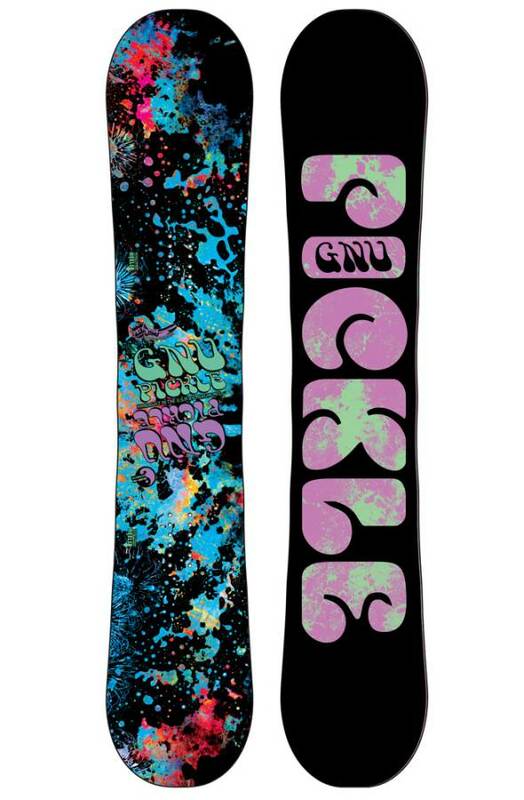 Jumps: The Gnu Ladies Pickle 2014 again offers up a little improvement when it comes to spring because the flat or minor camber after the rocker offers up a little more spring off the tip/tail but most of the pop is still more between the feet. It’s an easy ollie board and a pretty fun board for approaching the kickers as well. Very forgiving and poppy good time. 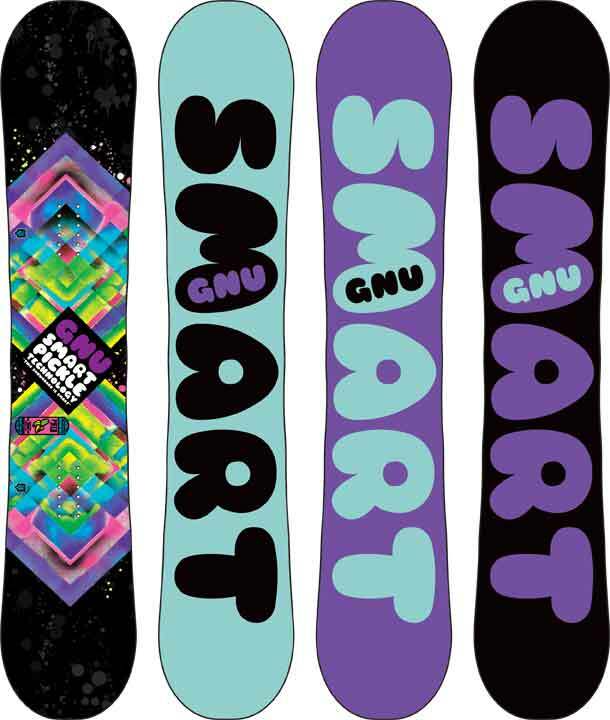 The Gnu Ladies Pickle 2013-2011 reminds us of a slightly stiffer asymmetrical version of the Narrow Lib Tech Skate Banana with a little less rocker in the tip/tail. This is all about the park but to our surprise the Pickle had a little personality on the mountain as well. This is the “Park Pickle” so when it comes to a loose but semi aggressive approach to freestyle this could work for a lot of riders out there. 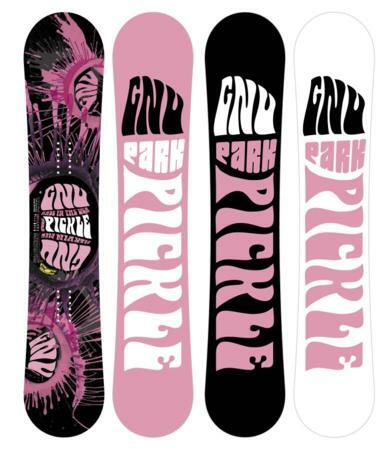 On Snow Feel: The Gnu Ladies Pickle has the same loose between the foot ride that most BTX boards have. That being said it does have less rocker than some continuous rocker boards in Gnu and Lib-Techs line. It’s more loose in hard and still pretty loose soft conditions. We normally prefer a hybrid shape but this rocker did a good job in mountain situations that it wasn’t designed for. We weren’t expecting much outside the park but the pickle quickly changed our opinion. We rode in steep to flat terrain and treated it all like we were in the park. It’s not amazing for taking a carvy speedy approach to groomers but it was pretty fun except for when it came time to flat base or one foot. This is jib park ride that can also play in the pipe and jump line. Powder: We didn’t have much powder to ride but there were a few untracked lines we found to get a feel. This is the Park Pickle so the operative word here is park. Park boards aren’t that great in the powder and this PTX continuous rocker shape doesn’t seem to be really super banana’d out and it has a flater feel to it. That being said the Gnu Park Pickle going to do a good job if you want to take a park inspired approach to the mountain. It’s just not going to be that great when it gets too deep. Turn Initiation and Carving: The park pickle took a little more work to make tight turns than we expected but it’s still on the easier side. When it came to making wider turns it was pretty fun. When we layed out a carve we were both expecting to have the board wash out but it did a pretty good job holding on. It is however not going to be that board you can make a belly scratching turn that could be expected. Speed: It’s a fast base and a pretty chatter free ride for a park board. Definitely more to offer here than the Skate Banana. It’s just not fun to flat base like we sometimes like to do to increase our speed. It has the same failings that most continuous rocker boards have. It is a little squirrely when flatbasing but on edge it’s fine. That being said it has all the speed you need for the park. Uneven Terrain: Soft and easy when you have to slow down and ride in rough end of the day snow. Approximate Weight: Like all Mervin boards the weight is close to the heavy side but the Park Pickle is very well made. Edge Hold: The Park Pickle grips anything as long as you are on edge. Flex: The Park Pickle seems to lean more to the medium side on the soft spectrum. It’s still soft enough to butter the whole way down a run. Pipe: You can hold a moderate carve and the edge hold is great so you can competently ride the pipe. If you like to launch out of the pipe the re-entry is usually pretty forgiving. There are better boards out there but the Pickle does a good job. Jumps: Like the Pipe the Pickle does a good job and will be pretty fun hitting the roller coasters in the park. It also has a pretty decent spring if you ollie around the mountain without the aid of a ramp. You just have to get use to finding the spring from the board in the middle instead of in the tip and tail with many camber or hybrid shapes. We would suggest this for someone who likes to ride mainly the park but occasionally ventures out to the other side of the fence. We try to get as many images of the Gnu Ladies Smart Pickle, but forgive us if they're not all there.